If you ask us at Callaghan Pump and Controls what physical size your pump system will be, we try to keep our package systems as compact as can be. On a standard 1 horsepower up to and including 15 horsepower systems with flows anywhere from 10 gallons/minute to 200 gallons/minute, we can build a duplex system. Our ¼” thick stainless steel base is 30.25’ wide by 36” long. 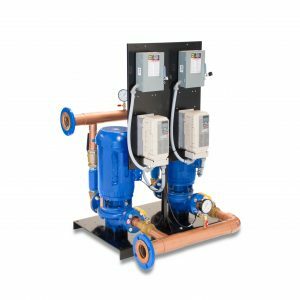 That duplex system includes two pumps, a metal stainless steel stand for the control panel that comes installed, suction and discharge copper headers. 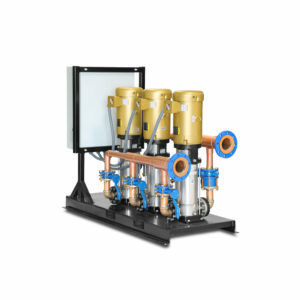 The system automatically comes with loss of prime shut down, low suction pressure shut down, and high system pressure shut down. So if the pump is discharging 80 pounds and your street pressure were to go up to 80 for some reason, your pump would not run as it will let street pressure flow through it while you save the electricity. You can change pressure at a click of a button and, if, for some reason, you feel you might be adding to the existing building you can order a duplex on a triplex base. So you will have three spots for three pumps, but right now while the building is still small and you only need two pumps. The extra space provides you with the ability to add the third pump in the future as your pumping needs increase. There is usually always room in the control panel for another drive mount. Especially in New York City, we make the system as small as possible as real estate is at a premium. 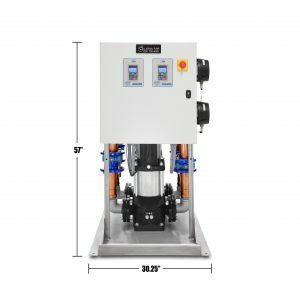 I don’t know of anyone who makes a more compact triplex domestic water booster system (a package with three pumps on the skid). The header can be 2”, 3”, 4”, 6’; header size depends on flow. 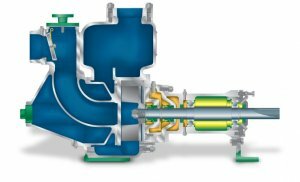 The more flow, the larger the suction and discharge pipe. The easy way to remember sizing is 2” is good to 200 gallons/minute, 3” is good to 300 gallons/minute and so on. 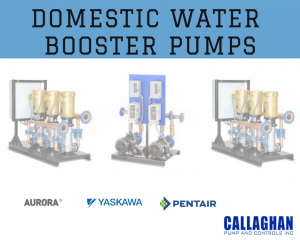 There is a chart that we can share with you if you call Callaghan Pump. While we are located in Hackensack, New Jersey, we do 90% of our sales to the 5 boroughs of Manhattan. Coincidentally, that also seems to be the area where the majority of tall buildings are located in our country. So it has been an ideal location for our company learning very quickly about what works and does not work in a highrise building. This is not to say that our systems would not work just as well in a low rise building. 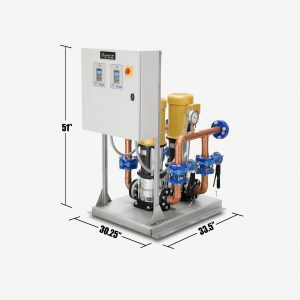 Administrators of low rise hotels and other two – three-story buildings often question why they need a pump — the answer is that it comes down to volume. Unless you run a 12” water main in from the street, chances are that you will need a booster pump; if you have any more than 30 apartments, you will need to boost the pressure up or run very large pipe in from the street. 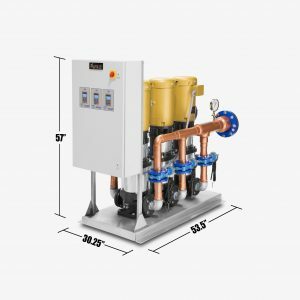 A lot of times, you look at the price of copper or stainless steel piping and if you can save $100,000 on the pipe, it pays to put in a $15,000 pump system. So why not do it? They are certainly easy to maintain; parts are readily available anywhere. 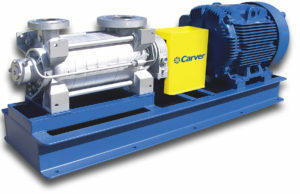 All major pump manufacturers have a pump that will bolt right down to our skid. Should these pumps ever cause you problems, parts and pumps from the major players in the industry will fit. We use very simple methods for our control system; they all operate off of ¼ “ female national pipe thread(NPT). You first install a ¼” ball valve to isolate any transducers that might require replacing 10-20 years down the road. You then put in either a T or a transducer. You can either put the transducer on the header or run the wire into the Callaghan Pump Domestic Water Booster System control panel. Customers in NYC, the Bronx, Brooklyn, Queens, often prefer them inside the control panel; you just have to remember to drill a ¼” hole in the bottom corner of the electrical control panel so that if water were to ever leak in, it will then have an easy method to drain out of the control panel. Callaghan Pump and Control has over 900 systems in the 25 miles radius of Times Square. We have very few, if any, premature losses or breakdowns. This claim is based upon the idea that we consider 50,000 hours to be the standard run time for our equipment. The motor bearings are roughly the same. 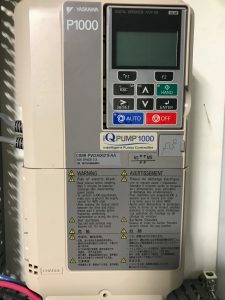 If you go with our standard 5 horsepower system, we always keep everything in stock to service these systems: we have transducers, we have variable speed Yaskawa drives– Model IQ Pump 1000, and we always have motors. Call Callaghan Pump and Controls any time you like for a free quotation.